Home >> Blog >> Pet and Dog Care >> Pet Fire Safety – Tip to keep your pet safe from house fires. 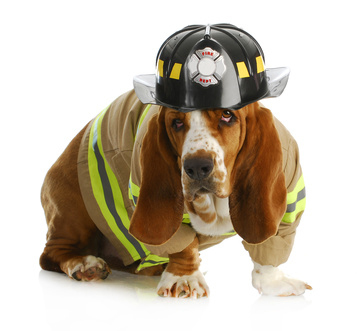 National Pet Fire Safety Day: What's Your Plan? According to the National Fire Protection Association, nearly 1,000 house fires each year are accidentally started by pets. Make sure you know how you can keep your pets safe from fire dangers. Here for some fire safety tips for you and your pet! Curious pets naturally want to investigate cooking appliances, fireplace fires and candles. Ensure your pets are not left unattended around open flames. Check for potential fire hazards – Stove knobs, loose electrical wires, flammable liquids, etc.. When leaving pets home alone, keep them in room near doors or windows where firefighters can easily see them. Affix a “Pet Alert” static cling to a front window. Pet can’t escape danger by themselves – these detectors alert a monitoring center to send help ASAP. Practice escape routes and have a safe place to take your pet after evacuation. Always keep collars, leashes and carriers in convenient location.